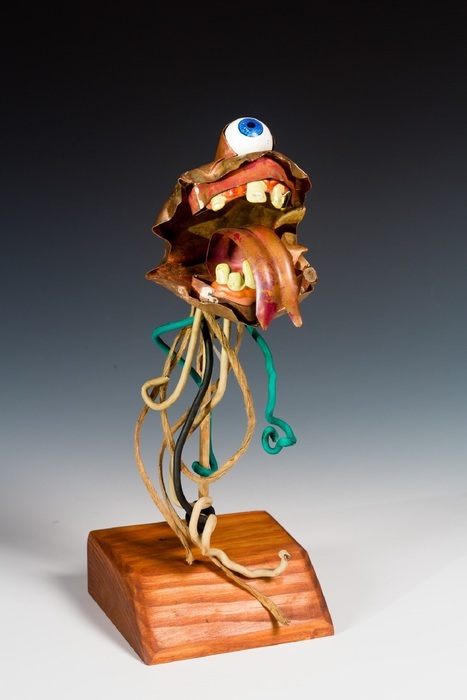 “As you look through my works, you’ll find some are friendly and humorous and some are a bit dark and creepy. That’s how I find life: the dichotomy of dark and light, happy and sad, good and evil reflects the outer world and my inner world,” says artist Max DeMulder. metalsmith, Nick Barnes and has worked with him for ten years. He also assisted sculptor Howard Connelly with projects. Currently, Max is an intern at Washington Glass School under the tutelage of Erwin Timmers along with Tim Tate and Michael Janus. Max has recently shown his art in the VisAbility Art Lab Exhibition, Concourse Gallery, VisArts; Grump, Crystal City, Virginia; Outer Limits at the Ratner Gallery in Bethesda, Maryland; Artomatic, Crystal City, Virginia; Creative Craft Council, Strathmore, Rockville, Maryland; Takoma Park Folk Festival, and VisAbility Art Lab Holiday Show.